Arabian Nights is a safe bet. It has top production values, including fantastic costumes and some of the most vivid Technicolor photography you’ll ever see — accentuated by the pristine DVD transfer. This is all especially surprising considering the film was made at Universal; and falls outside of the constantly struggling studio’s big four proven cornerstones: horror, Deanna Durbin, Sherlock Holmes, and Abbott and Costello. The story of how this came about is an interesting one. The business model at Universal, more than any other studio, relied on turning successful projects into drums that could be beaten again and again, until the public grew tired of the tune. Yet during the war audiences were hungry for the most lavish and exotic escapist fare possible, and the stars of Arabian Nights caught the public interest at exactly the right moment. Jon Hall, Maria Montez, and Jungle Book star Sabu would appear together regularly in a succession of lower-and-lower budgeted features that nevertheless raked in the wartime dollars for the studio. 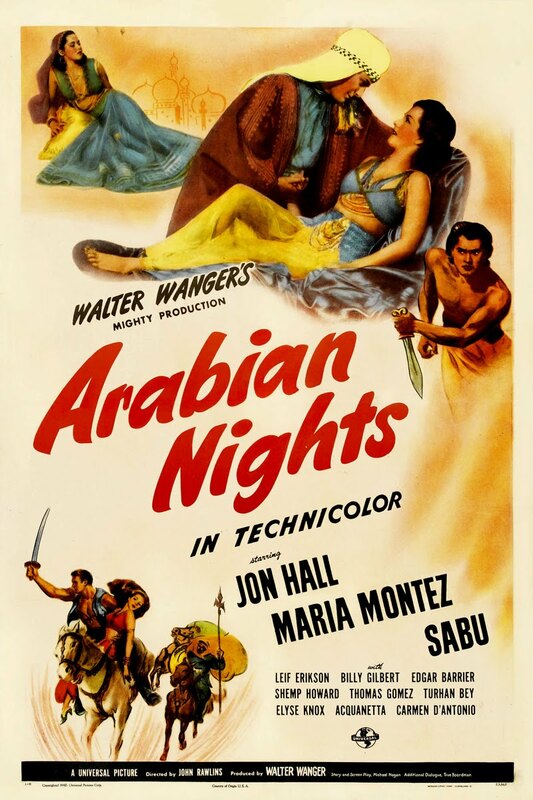 Sabu, the unlikely teen superstar, would receive top billing in most of the features, with Hall second and Montez third. Hall was the good-looking star of numerous B projects at Universal, he enjoyed modest success in Hollywood but never achieved the big time. Much the same can be said of Montez, though in her case it’s surprising. She was truly a stunning woman — bearing a vague resemblance to Gloria Grahame, only with a better figure — it’s difficult to take your eyes off her. On a morbid note, each of the film’s three stars died tragically: Hall, wrecked with cancer, shot himself at 64, while Sabu died of a heart attack at age 39, and Montez drowned (due to a heart attack) in her Paris bathtub at only 34. Arabian Nights is a winner. It’s easy to see why wartime audiences responded so well — the film couldn't get much lighter. We expect these things to be special-effects bonanzas, but there’s not much too see here beyond a parade of girls and marvelous costumes. All the genies have been replaced with light comedy, and supporting characters merely named Sinbad (Shemp Howard!) and Aladdin will have to placate those looking for faithful literary adaption. * Thanks to Thomas Schatz and his wonderfully instructive book, The Genius of the System for the assist on the facts and figures. Availability: DVD, but no Netflix.